Spike has definitely made a name for himself in the commercial industry of movie/music video making, but he was, and will always have an integral role in the BMX and skateboarding scenes. Aside from being co-founder and an instrumental creative force behind Girl Skateboards, Spike has also left a filmic legacy in terms of skate videos. I guess what really motivated me in filmmaking was the opening sequence of the Girl/Chocolate video Mouse. It's really, really simple, with just a guy dressed in a mouse suit who does some skating, and his friend who works at a fast food joint (w/Rick Howard and Mike Carroll). I know it's not an artistic masterpiece or anything, but it was so imaginative, and really had this childlike humour to it that made me wish I was a kid again. Or, I guess it made me realize that even though I'm not a kid, I can still direct that energy into things that make me feel just as good. Aside from the opening sequence, Spike also directed the "Eric Chaplin" short with Eric Koston. It only lasted about two minutes, and was filmed in a couple of hours for less than $500, including filmstock, transferring and post production. He also did the "Dinky" short with Keenan Milton, which was based on an episode of Wrench Pilot, a skate comic by Mel Bend (aka Andy Jenkins). 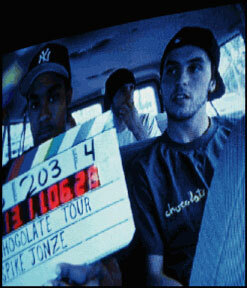 Spike had a major role in the new Chocolate video, the Chocolate Tour, as well. I have yet to actually see this video since the skate shop here is selling it for $40, but if you have any reviews or comments on it, I'd be happy to post them. I do know that it got a good review in Big Brother (which I know is sort of unreliable, but I'll take their word for it until I hear otherwise. This Skateboard section is the one I'm having the most trouble with, so if any of you have any credits or info on stuff he's worked on, I'd really appreciate it if you could let me know. Thanks!